I finally found a perfect ten acres in Cochise County, Gleeson, Arizona. It is a south sloping lot at an elevation of about 5200 feet in an area with lots of rolling hills. I have searched for property like this for ten plus years and finally, accidentally, came across this one and purchased it immediately. 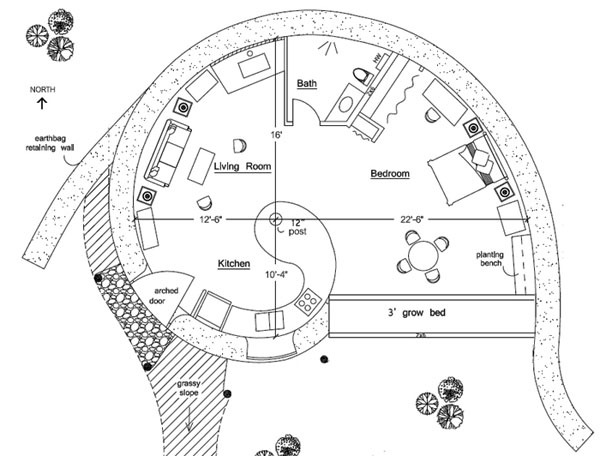 Now I want to start building a small home on this property and have decided to purchase the “Spiral House” plan. Before I make the purchase I would like to know if all of the calculations have been made for this house to be earth bermed on the north side and also proper calculations done to ensure a safe “Living Roof” if your plans are closely followed. I have also been following your website and checking out your house plans for a number of years now and I would like to say thank you for your help in providing timely and accurate information for those of us who need it. Your generosity is very much appreciated. Thank you. My plans are simple so they remain affordable to average people worldwide. Codes vary widely from country to country so that’s another reason to simplify them. Contact Structure1.com. They can get it code approved and permitted for sure. They just wrote and told me they’ve now done 20 earthbag houses and close to 50 similar type of structures. Note: This is a large successful company. Their first email will be a generic message requesting that you first buy house plans such as mine. That way they know you are serious and they won’t be wasting their time. I make nothing in this transaction. I’m just trying to help you out. I love this design. I have been working on a similar idea by adapting the ideas of a Tony Wrench inspired round house but instead of two concentric rings of supporting poles I would form a spiral with the entrance at the start of the spiral facing away from the prevailing winds. I searched for spiral home and found your design. Very interesting. Is this a perfect Fibonacci design?. If it’s not perfect, it’s still really cool. Thanks for your response. I’m already working with a local natural builder. You featured some of his work in your blog (casadeteirra.com). So, I’m trying to decide between earthbag walls or plaster/bamboo walls with earth fill. I know earthbag would be ideal for round shapes but I could create some geometiric cornered round shapes with the bamboo/earth walls too. Maybe even doing a combo of both. 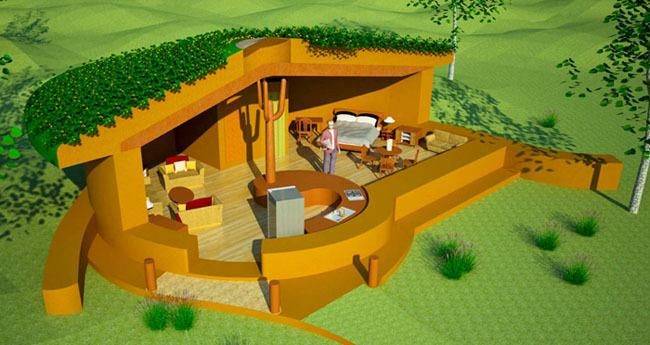 eg: round earthbag bedroom, with bamboo/earth wing extention rooms for a kitchenette, bathroom. Other than ensuring proper roof overhang and airflow, what/which technique would you reccomend as the ideal wall structure for wet/tropical climate like Nicaragua? Bamboo must be treated correctly or it will quickly rot. Some species are much better suited for construction use than others. It’s a big topic you’ll want to research. A combination of both might be best. Make short test walls on a tool shed, etc. as an experiment before building larger structures. I love love this design. I have a lot in Nicaragua that I want do build naturally on. I’ve been spending weeks trying to figure out how to do something similar to this but designed for the tropics. I was thinking of using bamboo for the roof framing and some kind of corrugated metal panels on top, maybe even spanish clay tiles. Also want move things around a bit in the floorplan to allow for a large outdoor covered open deck in the area where the grow bed. Can you help me customize this design? I no longer do custom plans. Keep studying local building methods, researching local materials and then adapt the design to your climate. Hiring a local designer would be beneficial for most. Might this design be used in Northern Canada with scoria filling for the bags? I have seen the design for the solar-pit-house – but, esthetically – this is the design and size I prefer. Yes, that would be a good choice. Try to locate the scoria first because it doesn’t seem widely available. And you might consider using 24″ wide bags for maximum insulation. Add 2 feet of scoria under the floor, extend the walls down 2′ deep to create an insulated foundation, and add lots of roof insulation.